I think it’s pretty apparent by now that I LOVE the holidays, and especially Halloween. There are so many fun traditions and activities associated with the holiday, and my entire family loves all that comes with it!! From pumpkin carving to creepy recipes, we try to get in as much fun as possible and are sure to have at least a few Halloween parties to attend. 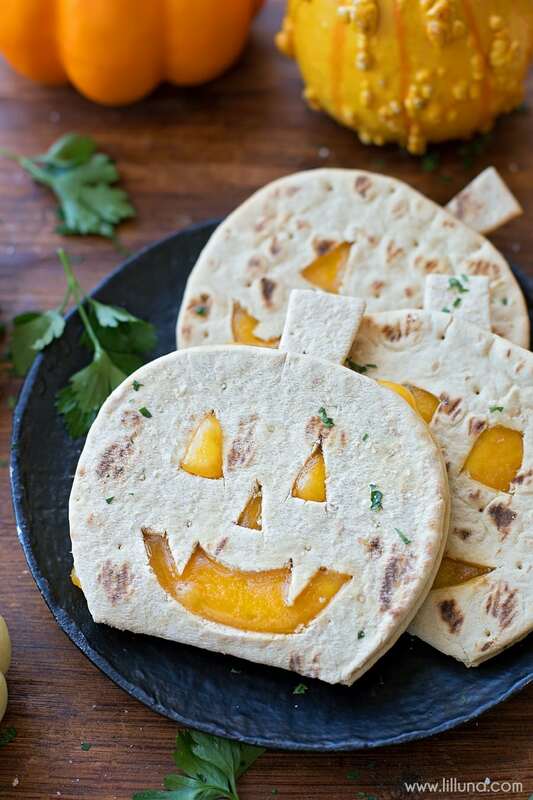 For the pumpkin: Using a sharp paring knife, cut a pumpkin face into one side of each flatbread. Reserve the larger pieces to create stems (if desired). Place a layer of monterey jack or mozzarella on the opposite side of the flatbread (the one without the face cut into it). Then layer with cheddar cheese. 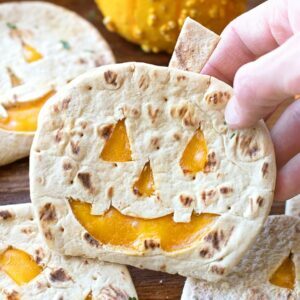 Fold the flatbread so that the cheddar is showing through the pumpkin face. Place in the oven and bake for 3-5 minutes. Remove and gently press on the face so that the cheese oozes through the cutouts. Serves 6. Microwave pepperoni on a microwave safe plate lined with paper towels for 15 seconds or bake for 5 minutes. Dab grease off. Spread the sauce over the flatbreads, leaving a small border. Sprinkle with parmesan cheese. Add pepperoni, place two in the enter towards the top. Add olives on top. Lay strips of string cheese over top. Place in the oven and bake for 3-5 minutes. Serves 6. 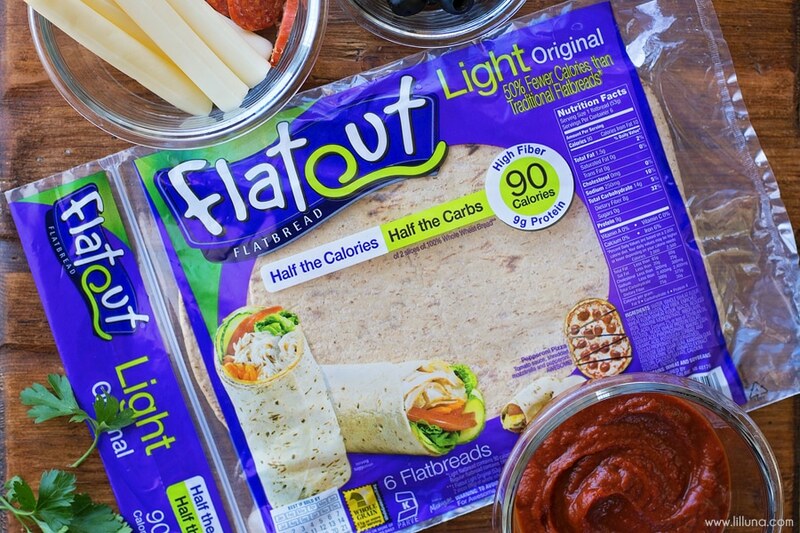 Any variety of Flatout Flatbread works great for the pizza, but we used the Light Original. 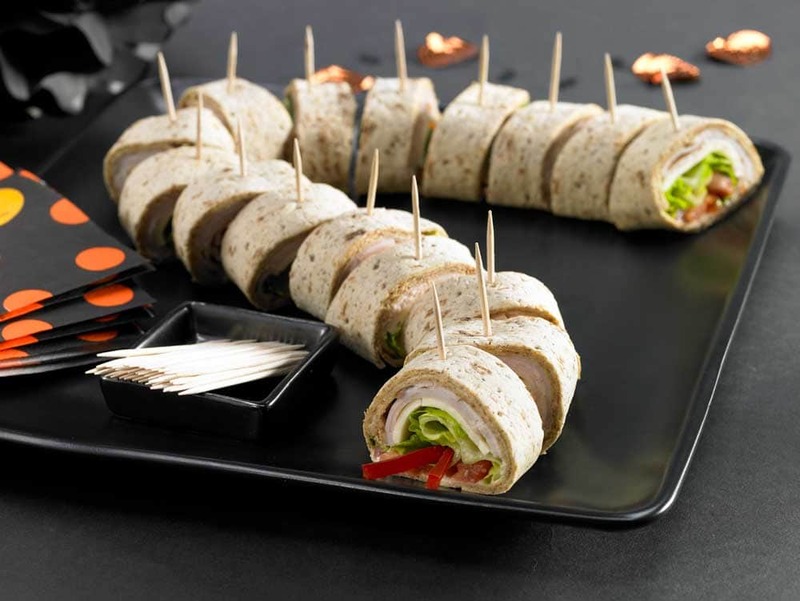 You can also use any of their Artisan Thin Pizza crusts, which the kids love as well. Spread the sauce over the flatbreads, leaving a small border. Sprinkle with parmesan cheese. Add pepperoni, place two in the enter towards the top. Add olives on top. Lay strips of string cheese over top. Place in the oven and bake for 3-5 minutes. So simple and the result is amazing!! 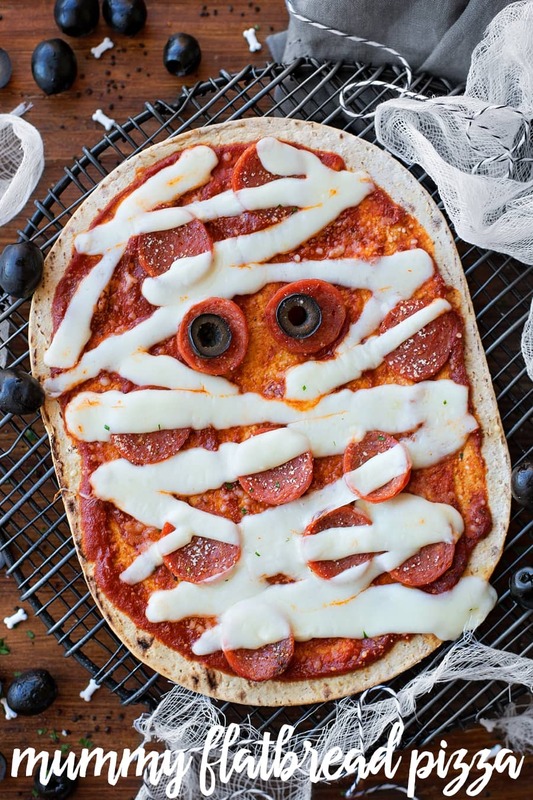 A super cute Mummy Pizza that the whole family will love! 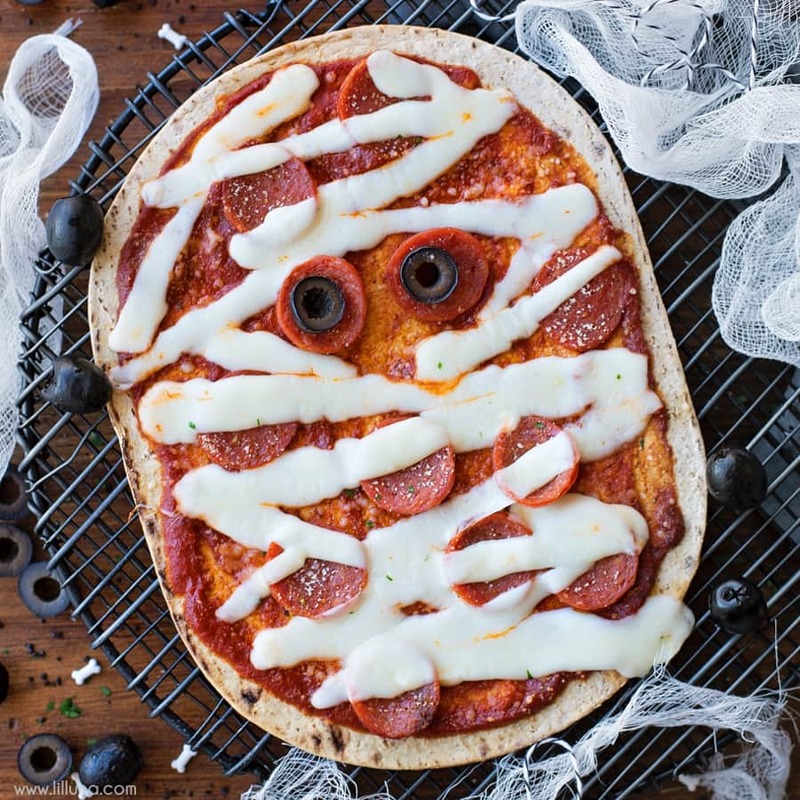 How could the kids not love this spooky recipe?! For the Pumpkin Quesadillas, we used the Foldit Traditonal White, but again, any Flatout Foldit works well for this. 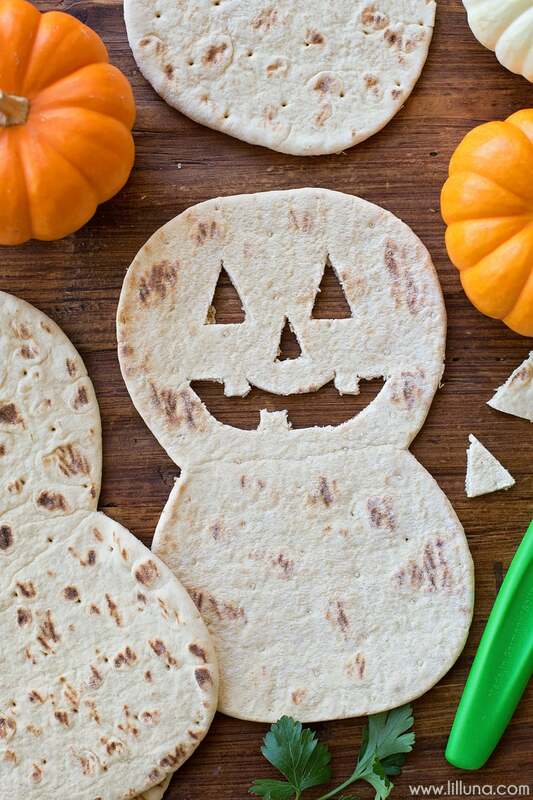 Using a sharp paring knife, cut a pumpkin face into one side of each flatbread. Reserve the larger pieces to create stems (if desired). Place a layer of monterey jack or mozzarella on the opposite side of the flatbread (the one without the face cut into it). Then layer with cheddar cheese. 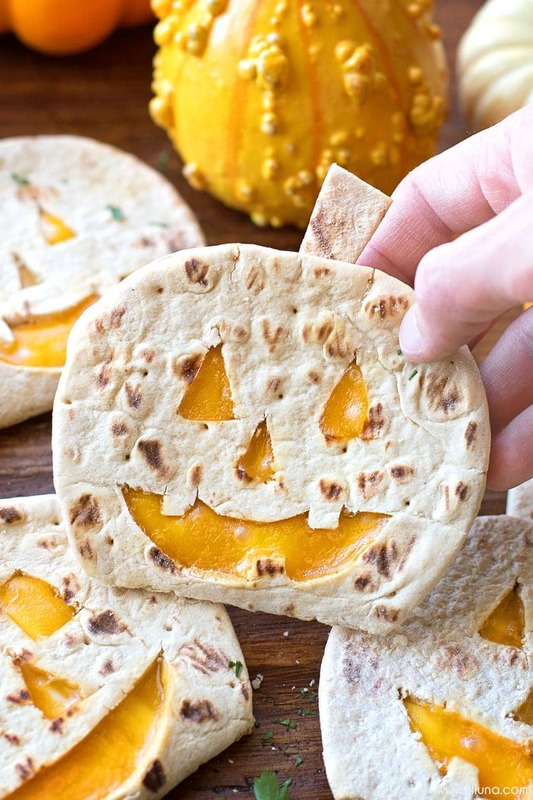 Fold the flatbread so that the cheddar is showing through the pumpkin face. Place in the oven and bake for 3-5 minutes. Remove and gently press on the face so that the cheese oozes through the cutouts. 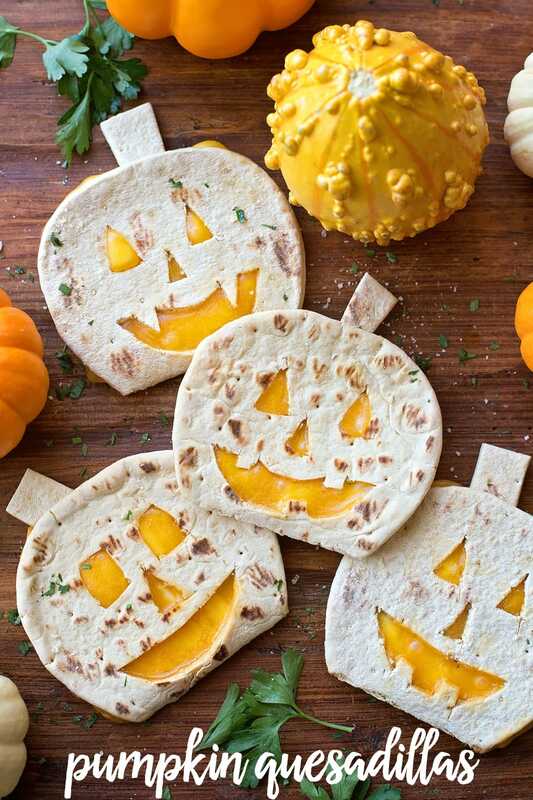 So many fun pumpkin faces you can make for these Pumpkin Quesadillas. These quesadillas are another fun and simple recipe that the kids will go nuts over! For all Halloween ideas on Lil’ Luna be sure to go HERE. 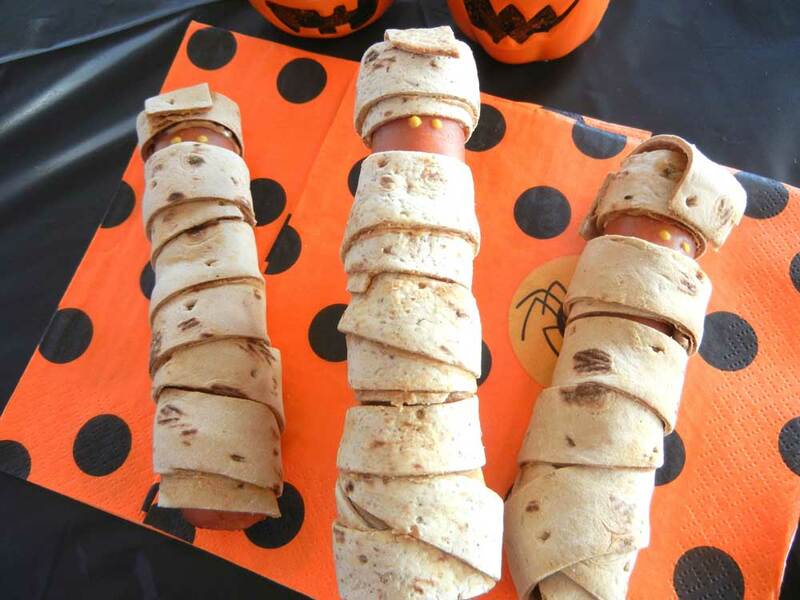 For more kid-friendly Flatout recipes go HERE. 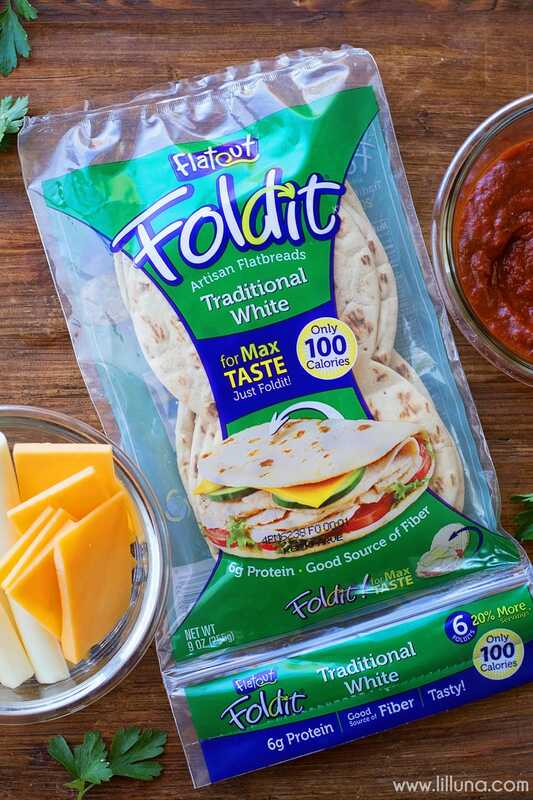 For more information about Flatbread be sure to follow them on Facebook – Pinterest –Instagram–Twitter. These ideas are so incredibly adorable! I can’t wait to pin them to share!! 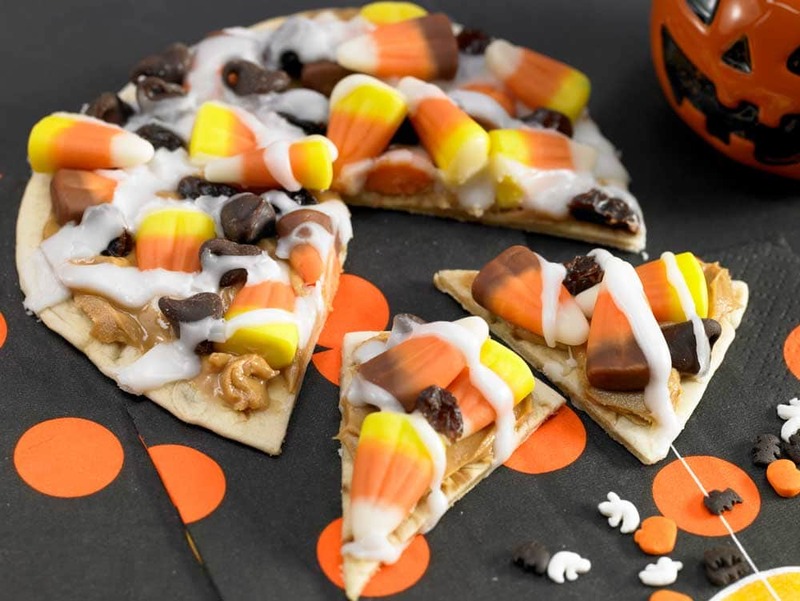 So perfect for Halloween parties, or even for feeding the little ghosties something nutritious before they rush out the door to grab all that Trick-or-Treat candy! Awesome ideas, gorgeous pics – what a fantastic post! 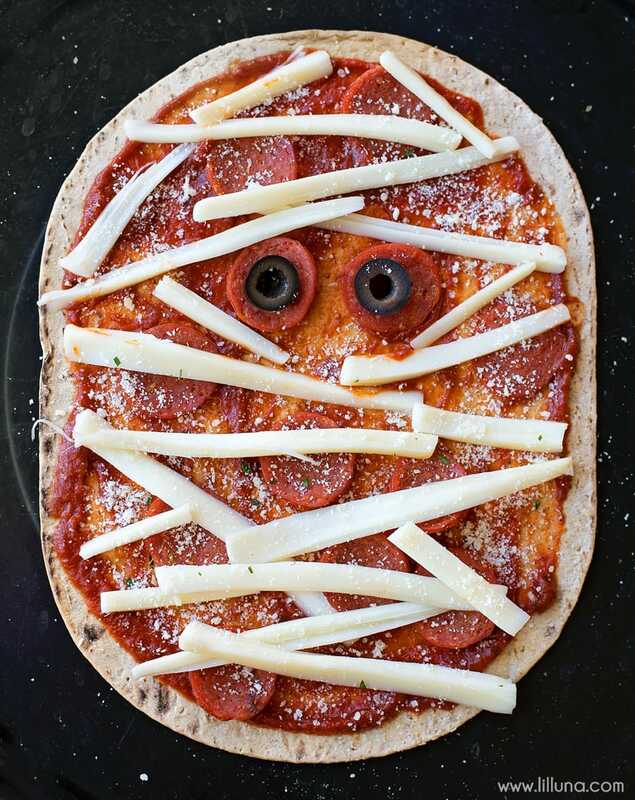 LOVED the mummy pizza!!! 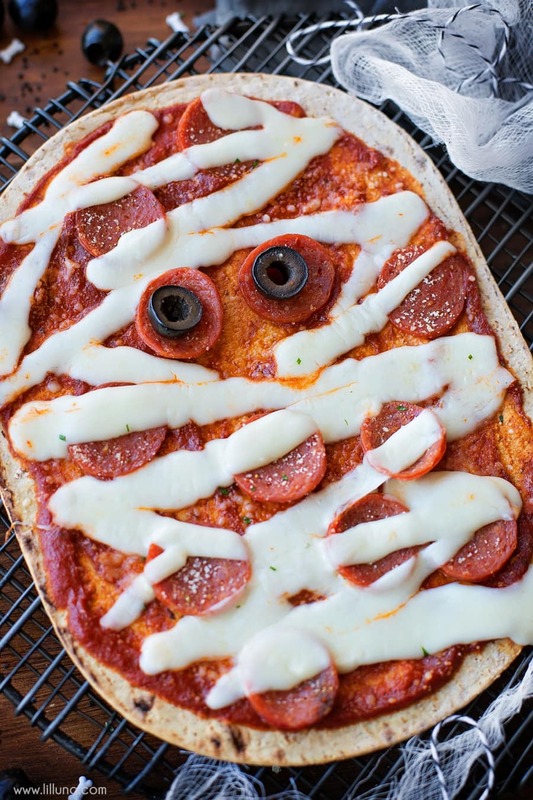 I also did a frankenstein cheese pizza with pepperoni eyes. love it! Couldn’t find the fold its. Yay!! Frankenstein would be awesome!